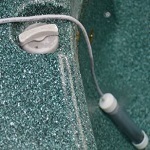 This easy to use spa and hot tub salt water chlorinator has great reviews and is a popular product. 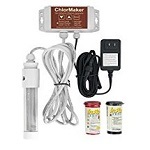 The ControlOMatic ChlorMaker Saltwater Chlorinator is virtually plug & play, is very simple to install and requires no spa or hot tub modifications. Enjoy your spa or hot tub longer with no more skin irritations with the ControlOMatic ChlorMaker. This system requires very little concentration of salt, roughly it requires 5% of the salt levels found in ocean water and most people wouldn’t even be able to taste it in the water. This ControlOMatic chlorinator is designed to be a drop-over (DO) unit meaning you hang the cell over the side of your spa or hot tub. This gives the advantage of being able to be easily removed when your spa is in use if so desired and not making it a permanent fixture to the spa. In addition, the spa (or hot tub) does not need to be on in order for the ChlorMaker to produce chlorine. There is an optional inline kit which will allow you to install this system into the spa’s plumbing, however the manufacturer recommends checking with your spa manufacturer’s warranty terms and conditions first as doing this my void warranty on your spa. The unit generates chlorine for a part of a 3 hour cycle, 8 times per day. The system allows you to adjust the level of chlorine produced so you have complete control over the free chlorine in your spa – one of 10 levels of chlorine production can be selected. Typical maintenance is required for this unit. As with all units, the cell plates should be inspected regularly for calcium deposits and cleaned if necessary. The ControlOMatic ChlorMaker chlorinator cell should be cleaned in an acid solution. Clean the cell repeatedly until all the white deposits are gone. As with most things, regular maintenance will help prolong the life of the unit. Operation is very straight forward and uncomplicated. There are 3 buttons and 4 lights – you don’t get much simpler than that. The buttons change the power level and the lights indicate the salt level. The ChlorMaker has 10 power level settings for adjusting chlorine production. Trying different levels of chlorine production until you get the right level will be something you do for the first weeks. You should test the chlorine level in the water every couple of days until you get it within the recommended range. This system includes a “vacation mode”. It will set itself into vacation mode when no buttons have been pressed for over a week. In “vacation mode”, the unit will decrease the operational time to reduce the amount of chlorine produced. There is a boost mode which actually doesn’t increase the level of chlorine produced, instead it increases the run time of the chlorinator. The user manual contains a handy table that lists each power level, include boost mode, and the run time of the chlorinator. The system is warranted for 1 year. The warranty is conditional on the product being according to the instructions in the user manual which is pretty much standard.